Keep your clients up to date and wanting more with newsletters, press releases, and events. We've covered the websites and the social media sites, but what about reaching out to those who aren't so internet saavy? Let us help you design e-newsletters or e-flyers to get the word out via email. Whether monthly or quarterly, a newsletter is a great way to keep everyone tuned in to your business. Did you recently have a news-worthy activity within your business or organization? Do you have something you'd like to share outside of your normal market reach? Press releases are a great way to share information to the rest of the community -including those you may not normally connect with. Let us write your press releases and help you expand your market. Nothing gets people talking like a spectacular event. We at Up Your Marketing understand how much time and effort goes into planning a memorable event. Manage your time by letting us handle some of those little details that aid in making your event a huge success. From organizational activities to conferences, we can assist you along the way. 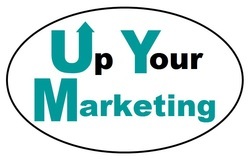 Up Your Marketing is a limited liability company designed to help small businesses and organizations that may not have the resources or capacity to develop and maintain their own digital marketing.